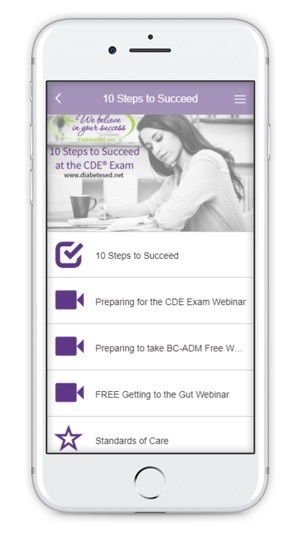 CDE® Coach integrates powerful study tools and diabetes clinical resources for Health Professionals who are ready to take their diabetes clinical care to the next level! Enjoy instant access to our popular medication PocketCards, FREE webinars, critical articles, newsletters, books and study tools all in one app! 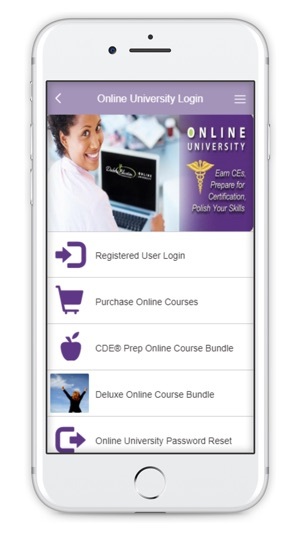 This App was designed by CDE® (Certified Diabetes Educator) Coach, Beverly Thomassian, RN, MPH, CDE®, BC-ADM, a nationally recognized diabetes expert who has passed her CDE® Exam five times and helped hundreds of health professionals add the CDE® credential after their name. What a great app! The podcasts are easily downloadable and convenient to listen to on my commute to work. The in-app pocketcards are extremely helpful and informative as well. Love this app !! Used it to access my 'CDE boot camp' course by Beverly Thomassian and listened to the podcast to and from work daily. It was compatible with my phone (iPhone 6S Plus), very clear and I could pause it and resume the podcasts where I left. I also use it to access the Diabetes standards of care and drugs in my daily practice - love, love, love it !!! This app is my "go to." 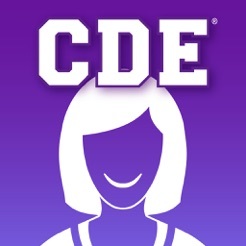 The resources a busy CDE needs are in this app, are easy to find, and are kept up to date. It's been developed by leaders in our field who understand what our days look like and the challenges we face. A definite "must have!"